Another rest day? Didn’t you just rest two days ago? What, you don’t like riding bikes anymore? 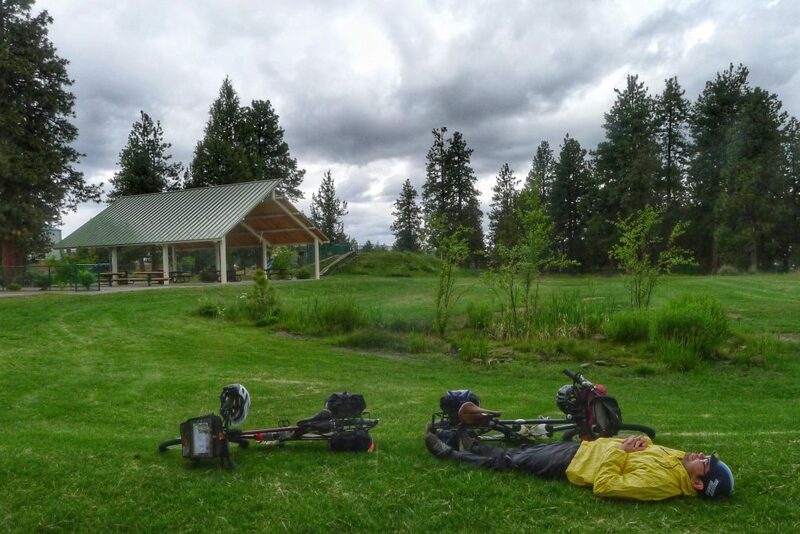 Are you on a bike tour or a loafing tour? After we left our motel we loaded in a park until it started raining. I have no excuses. Carrie and I had already arranged to stay with a Warm Showers host in Bend. We just happened to get to Bend a day early. Plus, we’d heard so many good things about the town that we were excited to have some time to get to know it. After a morning of extreme loafing, we left our motel in the south side of town and rolled to the lovely Ponderosa Park, about five blocks away. It was coming up on lunch time and those five blocks were brutal. We found a patch of grass sheltered from the cold wind and had ourselves a nice picnic. After our al fresco meal we headed over to the home of our Warm Showers hosts Carol and Perry. We contacted them out of several hosts to choose from in the area because of their unique living situation. Carol and Perry live in an intentional community. What’s an intentional community, you ask? From what we understand they can differ quite a bit. In Carol and Perry’s case they live in a single family house on a shared piece of property with several other neighbors in single family homes. The property, known as Higher Ground, also has a community house, garden, playgrounds, and other shared amenities. Most intentional communities have a theme or some core principles they follow. In this case Higher Ground residents support environmental stewardship. Their houses are thermally efficient and many have grid-tied solar power. They produce a lot of their own food in the large garden. And they tend to ride bikes or walk before using cars to go places. When we arrived Carol and Perry took us to the community house, where they were finishing up a garage sale. We met lots of residents and helped them pack up the unsold goods into a van, which was then headed to a local charity. Carrie and I have long dreamed of living in a community like this. It was great to experience a piece of the community pie. In our neighborhood we know the names of our nearest neighbors but our interactions stop at saying hello and having brief conversations. It was nice to see that this small group of people could successfully recreate the old village community within the larger town of Bend. 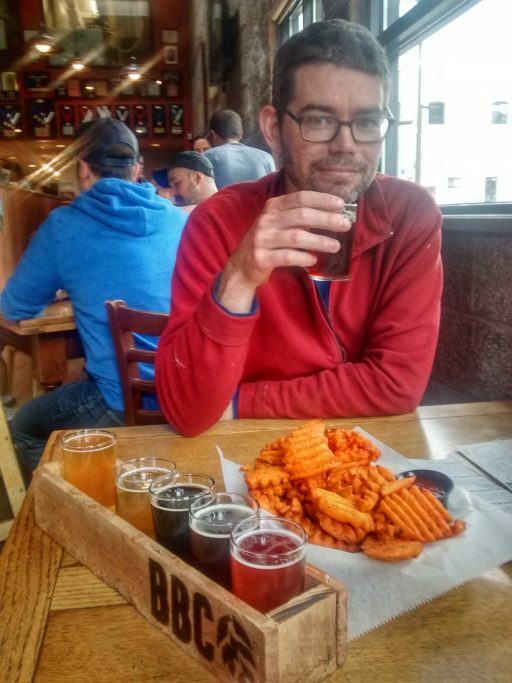 Sampling beer and munching on some sweet potato fries at the Bend Brewing Company. Speaking of Bend, we’d opted to stay here because of its reputation as a fun place to visit. So after helping with the garage sale we rode into town to check it out. Downtown Bend welcomed us with a short burst of hail. It was already colder outside than we were dressed for so we sought shelter in the nearest building we came upon, which turned out to be a brewpub. When we were in Ireland last year I told Carrie that I could throw a rock in any direction and hit a B&B. In Bend those rocks would hit brewpubs. Bend has at least 15 brewpubs and I think its population is less than 100,000. In San José we have over a million people and I’m only aware of one brewpub. After sampling some beer at the Bend Brewing Company we walked around downtown, had some tea at a quaint bookshop cafe, and then walked some more. The downtown is small but charming. It was nice to see so many businesses open and seemingly doing well. Most of the small towns we’ve been passing through up to now have looked derelict and half abandoned.